A team from the MAZI project attended the 2016 Net Futures conference in Brussels, in April. 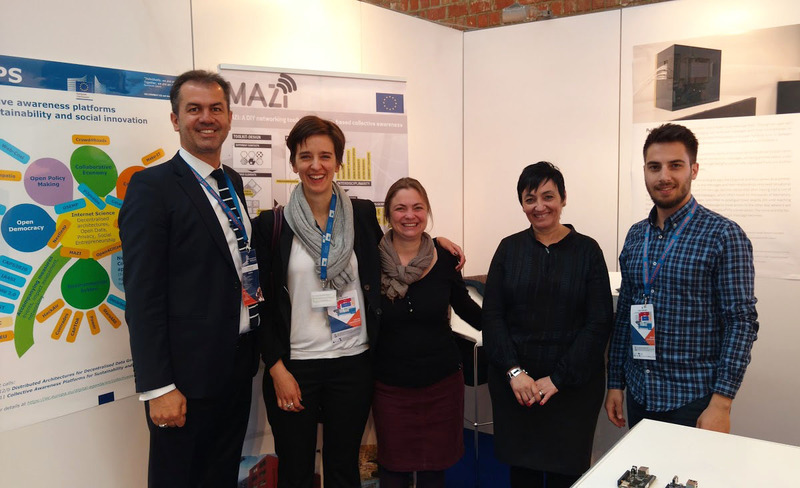 The MAZI booth in Net Futures 2016 event presented an initial version of the MAZI toolkit. A Wi-Fi network was deployed using a Raspberry 3 device which featured a built-in Wi-Fi interface. Our visitors could connect to this network and participate in a survey that was installed locally on the Raspberry and stored its results locally, too. Questions like: “Have you ever used an offline network?”, or “Would you find useful an offline network?” will be used as feedback for the appropriate implementation of our toolkit. The MAZI project is part of the Collective Awareness Platforms for Sustainability and Social Innovation (CAPS) theme within the EU’s Horizon 2020 research programme. Emerging and grassroots distributed approaches can mitigate or reverse the increasing concentration of power and economic value in the few dominant Internet actors, for instance in social networks, searches, e-commerce or content distribution.The objective of the research in this field is to harness the collaborative power of ICT networks to create collective awareness of sustainability threats and enable collective solutions. Collective awareness platforms include several areas, such as collaborative consumption, getting facts/evidence from citizens for better decision making, driving sustainable behaviours and lifestyles, or developing alternative collaborative approaches to problem solving. The Net Futures conference wishes to maximize competitiveness of the European technology industry. The conference gathered over 1.000 attendees, to form an interconnected community involving companies, organizations and people in; Research & Innovation, Market Validation & Living Lab Research, Business Development, Entrepreneurship & Enterprise Strategy and Policy Making.